Gregor Mendel is famous for discovering “particulate inheritance” or the idea that hereditary elements are passed on in discrete units rather than “blended” together at each new generation. Today we call those discrete units genes. A gene is a hereditary factor that determines (or influences) a particular trait. A gene is comprised of a specific DNA sequence and is located on a specific region of a specific chromosome. Because of its specific location, a gene can also be called a genetic locus. An allele is a particular variant of a gene, in the same way that chocolate and vanilla are particular variants of ice cream. An organism’s genotype is the particular collection of alleles found in its DNA. An organism with two of the same alleles for a particular gene is homozygous at that locus; an organism with two different alleles for a particular gene is heterozygous at that locus. An organism’s phenotype is its observable traits. An organism can have a heterozygous at a particular locus but have a phenotype that looks like only one of the two alleles. This is because some alleles mask the appearance of others in a dominant/recessive pattern. A dominant allele produces its phenotype whether the organism is homozygous or heterozygous at that locus. For example, in humans the allele for brown eyes is dominant to the allele for blue eyes, so a person who is heterozygous at the eye color locus will have brown eyes. A recessive allele produces its phenotype only when homozygous at the locus; its phenotype is masked if the locus is heterozygous. For example, a person must have two copies of the blue eye color allele to have blue eyes. Sometimes specific recessive alleles are associated with diseases. A person who is heterozygous for the gene will be phenotypically normal, but carry a copy of the recessive, disease-associated allele. This person is said to be a carrier and can pass on the disease allele to his or her offspring. You can see in the first generation (F1) that all offspring produce round seeds, even though they both the round and wrinkly alleles. If the F1 generation self-fertilizes (pea plants – like most plants – produce both male and female gametes), then you now see some offspring that produce rounds seeds and some that produce wrinkly seeds. The round:wrinkly seed producers exist in approximately a 3:1 ratio, illustrated by constructing a Punnett square. Punnett squares illustrate the fact that each pea plant gamete contains only one allele for each trait. Even though adult pea plants have two copies of each allele, these two alleles become into different gametes. Thus when two gametes come together to create a new plant, each gamete carries one allele resulting in two alleles in the new plant. 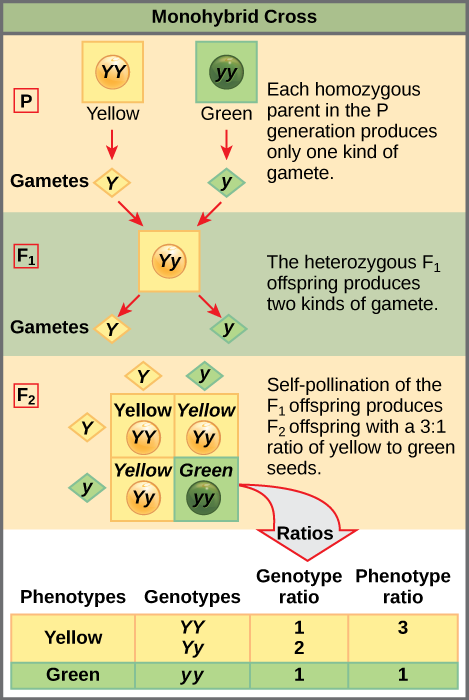 The idea that each gamete carries only one allele for each trait is the principle of segregation; that is, the two alleles for a particular trait are segregated into different gametes. Pea plants have a lot of other traits beyond seed shape, and Mendel studied seven other traits. Things become more complex when you follow more than one trait at at time. Here is a cross looking at both pea shape (round or wrinkly) and pea color (yellow or green). Follow the logic of the cross below to see why offspring demonstrate a 9:3:3:1 ratio of different phenotypes. Punnett squares that show two or more traits illustrate the idea that alleles for different traits (different genes) are segregated independently of each other. Yellow seeds are not always round, and green seeds are not always wrinkly; there can be yellow wrinkly seeds, yellow round seeds, green wrinkly seeds, and green round seeds. The idea that alleles for different traits are segregated independently is the principle of independent assortment. Mendel’s laws (principles) of segregation and independent assortment are both explained by the physical behavior of chromosomes during meiosis. Random, independent assortment during metaphase I can be demonstrated by considering a cell with a set of two chromosomes (n = 2). In this case, there are two possible arrangements at the equatorial plane in metaphase I. The total possible number of different gametes is 2n, where n equals the number of chromosomes in a set. In this example, there are four possible genetic combinations for the gametes. With n = 23 in human cells, there are over 8 million possible combinations of paternal and maternal genotypes in a potential offspring. In class, we will use the information discussed above to determine possible offspring types and phenotypic ratios using simple probability rules. 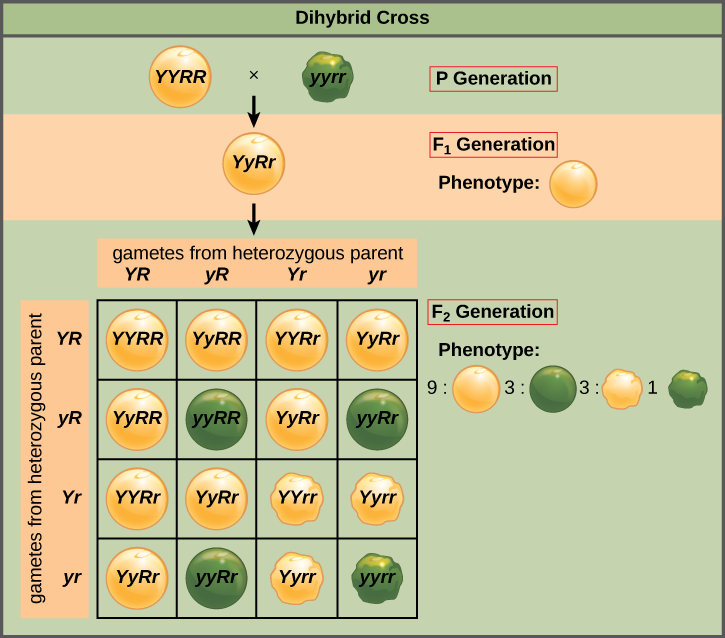 For crosses that involve 2 or more independently assorting traits, using probability rules can be much faster and easier than using 4 x 4 Punnett squares (for 2-factor crosses) or 8 x 8 Punnett squares (for 3-factor crosses. The number of possible gametes is 2^N, where N is the number of factors (genes), and the size of the Punnett square needed is 2^N x 2^N! So instead, we can calculate the outcomes for each factor or gene, then multiply the results. Example: a cross of AaBbCcDd x AaBbCcDd, where A, B, C and D are 4 different genes, with the dominant alleles given as A, B, C, and D, and the recessive alleles are a, b, c, and d, respectively. What proportion of the progeny will have the dominant phenotype for A and B, and recessive for c and d? If we look at just Aa x Aa, we know that 3/4 of the progeny will have the dominant A phenotype. Similarly, for just Bb x Bb, 3/4 of the progeny will have the dominant B phenotype. For Cc x Cc, 1/4 of the progeny will have the recessive c phenotype (cc genotype). For Dd x Dd, 1/4 of the progeny will have the recessive d phenotype (dd genotype).